Global innovation leader and number one PC developer Lenovo inaugurated its first ‘Legion Concept Store’ in the Philippines as part of efforts to bring game-changing devices closer to Filipino gamers in the company’s bid to own the local gaming segment. Located at the 4th floor of the Annex Building of SM City North EDSA, the Legion store features a wide range of products from Lenovo’s Legion gaming lineup, which visitors can personally test and play games on. Launched in the Philippines in 2017, the Lenovo Legion line has established significant foothold in the country and is expected to continuously increase in sales and popularity among the gaming community. “As the gaming market grows exponentially every year, we at Lenovo would like to maintain our commitment in providing best performing and top of the line devices to the Philippines, which includes the Legion line of gaming notebooks. The exclusive Legion store was conceptualized to support the local gaming culture and provide virtually everything that a gamer needs,” said Lenovo Philippines Country General Manager Michael Ngan. In addition to showcasing Legion products, the store will occasionally hold mini gaming tournaments to further engage the local gaming community. The Legion store at SM City North EDSA is just the first of many planned Legion Concept Stores set to open all over the country. 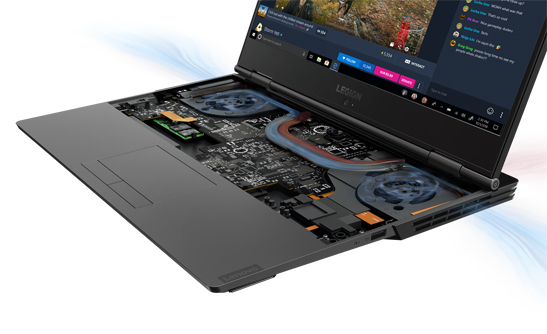 At the inauguration of the first Legion Concept Store, Lenovo also showcased the Legion Y740 gaming laptop, Lenovo’s first device to have NVIDIA® GeForce RTX™ graphics card. Geared towards eSports professionals and mainstream gamers who mostly play the latest AAA games, the Philippine release of the Legion Y740 boasts of having the NVIDIA® GeForce RTX™ 2060. Powered by NVIDIA’s Turing architecture and its new RTX platform, the GeForce RTX™ 2060 has up to 6X faster performance than the previous generation of graphics cards. “With new and upcoming PC games being increasingly demanding in terms of graphics, NVIDIA’s RTX graphics cards are what mainstream gamers need if they want to fully immerse themselves into these worlds, as it allows everyone to play at maximum settings while providing crisp and clear quality like never before,” said Ngan. Combined with the Intel® Core™ i7-8750H processor, the Legion Y740 easily handles graphics-intensive games like Shadow of the Tomb Raider, Battlefield V, and Anthem at either 1080p or 1440p resolution. The Legion Y740 prides itself as the thinnest and lightest among similarly specced and priced NVIDIA RTX-powered devices, being only 19.95 mm thin and 2.2 kg (4.9 lbs.) light. Other unique features are its RGB Keyboard powered by Corsair iCue and USB-C Thunderbolt 3 support. The Legion Y740 comes with 16GB RAM, 1TB + 256GB SSD memory, and a 15.6” FHD IPS 144HZ (slim bezel) panel size. The device is available for P119,995 at the Legion Concept Store, Lenovo Concept Stores, and at major electronics stores nationwide. Buyers can enjoy two-year onsite warranty, and those who purchase up to March 31 can avail of a free JBL Clip 2 and Lenovo Accidental Damage Protection (ADP) support worth as much as P9,000 as part of an ongoing promo.